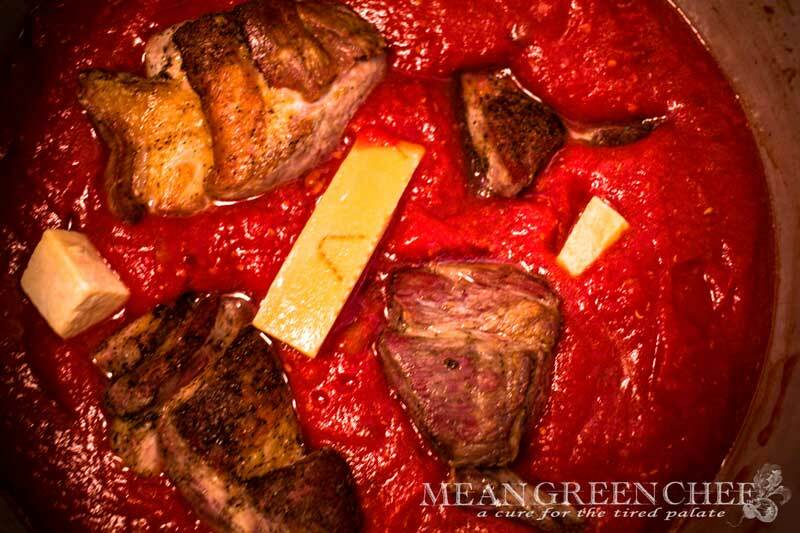 Authentic Italian Red Sauce with Pork, straight from our kitchen. This is the real deal sauce, ideal for pasta of all varieties. The prep and initial cook time are quick, but the key is allowing the sauce to simmer over the course of the day. It develops a rich and robust sauce that demands you mop it up with warm crusty bread. Deeply browned Country Style Ribs lay the groundwork for a mouthwatering sauce. Imparting an intense flavor, thanks to the magic of Maillard reaction. Pick the Best Tomatoes: In an ideal world, we would all have the time and space to have a beautiful garden. However, many of us have to opt for canned tomatoes. I’m here to tell you a good canned tomato can far exceed the quality of many tomatoes sitting in the produce section. Look for whole San Marzano tomatoes you can crush by hand. Trust me it’s worth it! Now if you’re one of the lucky ones with some nice tomatoes out your back door, or on your rooftop garden then you’re all set! Select the right pot: Use a large heavy-bottomed saucepan to prepare the sauce from start to finish. It allows the tomatoes to cook down and release their moisture resulting in a polished sauce. Low and Slow: Cook your sauce low and slow for as long as possible, it develops a rich, thick and savory sauce. Ours cooks a minimum of 8 hours. 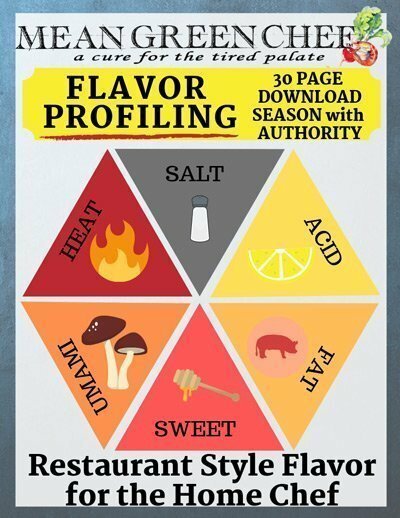 And if you really want the flavors to meld, make it the day before. Letting it sit in the fridge overnight creates a true harmony of flavor. Testing Red Sauce for Doneness: Before ladling over your pasta, check your sauce to be sure it’s cooked down to the right consistency. To do this, take a spoonful out of your saucepan and see how much liquid bleeds from the sauce. If there’s only a small amount of liquid your sauce is ready, if there’s a sizable measure, allow your sauce to continue to simmer low and slow. Adding leftover Parmesan Cheese rinds to your sauce develops umami flavor. If the rinds don’t completely dissolve while cooking, remove before serving. Try our easy egg yolk pasta recipe and whip up a batch of fresh dough that can be turned into your favorite dish. Whip it up in minutes in your food processor. Authentic Italian Red Sauce with Pork, straight from Nonna’s kitchen. This is the real deal sauce, ideal for pasta of all varieties. Remove Country Style ribs from the refrigerator, season with Kosher Sea Salt and fresh cracked black pepper and allow them to come to room temp for 30 minutes. Heat a large heavy-bottomed saucepan over med-high heat. Once hot add olive oil and heat for 30 seconds. Add seasoned Country Style Ribs fat side down into hot oil. Ribs will become stuck to the pan, while they brown. Allow to sit undisturbed, they will release from the pan once they brown. Flip and brown remaining sides. Remove from pan and set aside. Add the sausage and crushed fennel to the saucepan, stirring occasionally until browned. Add the onion to the sausage and fennel and cook till translucent about 5 minutes. Add crushed garlic and stir for 30 seconds. Carefully add the dry red wine and deglaze the pan, stirring with a flat wooden spatula until the wine has reduced slightly about 2 minutes. and all of the browned bits have lifted from the bottom of the pan. Add the rest of the ingredients, hand-crushed whole tomatoes, crushed tomatoes, Parmesan Cheese rind, basil, bay leaves, oregano, sugar, Kosher Sea Salt, and fresh cracked black pepper. Return the Country Style Ribs back to the sauce and bring to a simmer over med-low heat. Simmer 6-8 hours uncovered, stirring occasionally. The sauce will store safely in the refrigerator up to 3 days. For prolonged storage allow the sauce to cool completely. Store in freezer-safe containers or heavy-duty freezer bags, the sauce will maintain its best quality up to 6 months. We hope you and your family enjoy this Authentic Red Sauce Recipe. Check out our Spicy Shrimp Scampi over Zucchini Noodles, delicately sauteed with fresh garlic, lemon zest and capers. Also be sure to check out our Meatball and Italian Sausage Subs with Pesto!